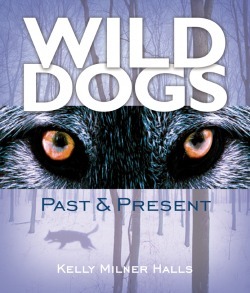 The author, a master of nonfiction, welcomes readers to the world of wild dogs with this fact-filled, educational title. 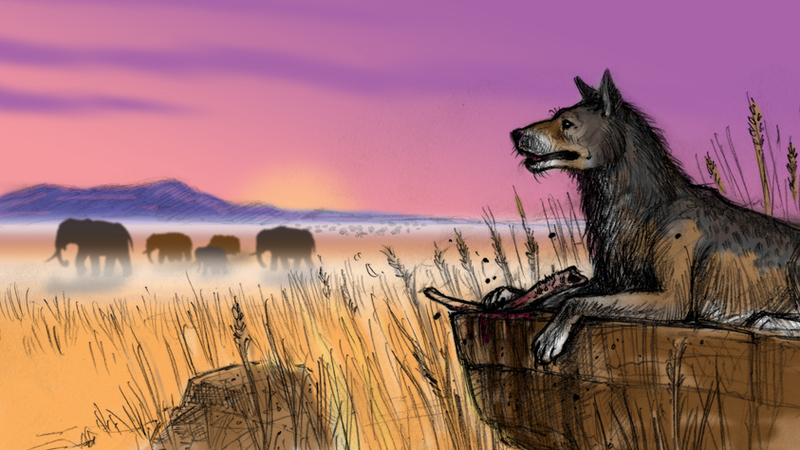 The text's information on wild dog runs the gamut from ancient canines to those surviving in the modern world. Well-organized and detailed chapters cover dogs from North America, Europe and Asia, Africa and the Middle East, Australia, and Central and South America. Each chapter contains a map highlighted to show where wild dogs roam. A few illustrations and a plethora of close-up, quality photos enhance the pages. Facts about some of the dogs include weight, length, stature, height, and color for easy comparison between similar dogs in a species. Scientific names as well as the more common names are offered. Dog myths and legends are included. Sidebars deliver more knowledge. While the reading may be difficult for readers younger than 12, photos would hold their attention as they look through the book. This is a comprehensive "must-have" for libraries and schools. 2005, Darby Creek Publishing, Ages 12 up. Gr 5-9-This well-designed book explains how fossils and DNA are used to show the evolutionary lines from prehistoric canids to the dogs we live with today. In a relaxed tone, Halls conveys complex scientific information as she explains why some species die out while others survive and evolve. Common and scientific names are used, and an explanation of taxonomy as it relates to dogs is included. The author presents a wealth of detail through the accessible text; the informative captions, charts, sidebars; and the simple but clear maps. After a trip back 60 million years, Halls takes readers around the world providing photographs and facts about the wild dogs that live on each continent. She also addresses folklore and how various cultures have viewed these animals. The importance of conservation is emphasized, and an explanation of how the reintroduction of one wild species to a habitat can bring the return of others paints a clear picture of the interdependence among animal and plant species. The book ends, like it begins, with references to domesticated dogs, bringing science right into the lives of its readers. An extensive bibliography includes interviews, periodicals, and Web sites, as well as books. An attractive choice for reports or recreational reading.-Susan Oliver, Tampa-Hillsborough Public Library System, FL Copyright 2005 Reed Business Information. Above is nother rough sketch by Rick Spears not used in the final book. 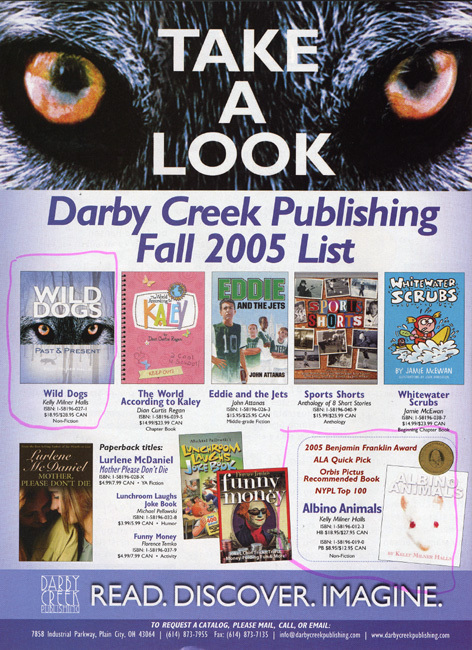 and below is an ad Darby Creek ran advertising the book and other great titles on their list (including WILD DOGS and ALBINO ANIMALS). The cover that got away! 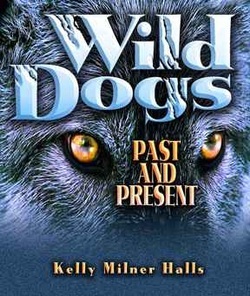 The cover above was the final cover for WILD DOGS. But other possibilities were considered, including the one on the left. This was my personal favorite, but I like the one they selected, too.